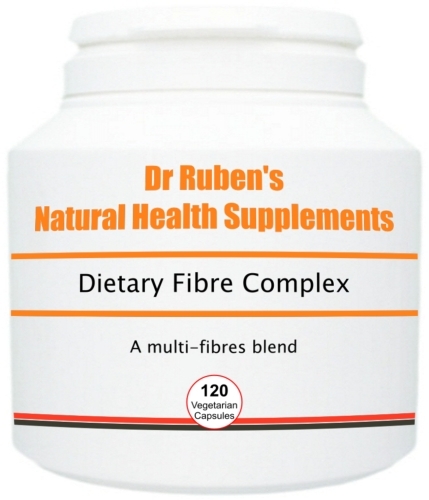 Our Dietary Fibre Complex is a high-fibre nutritional formula in capsules, derived from psyllium husks and seeds, flaxseed, prune juice, fig fruit and other high-fibre foods and herbs. This combination of insoluble and soluble fibre is more than just roughage - it provides cellulose, pectin, omega oils, hemicellulose, lignin and gums. This, in particular, is beneficial for healthy digestive function and bowel regularity - soluble fibre has even been shown to have a beneficial effect on cholesterol levels when taken as part of a low-fat diet. It is thought that this is because fibre has a natural tendency to decrease the absorption of bile salts. There is a well-established link between constipation and a low dietary fibre diet. 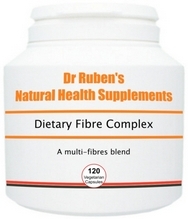 Dietary Fibre Complex is a natural solution for body waste cleanse! Take 3 - 8 capsules per day or adjust intake as required. Always take with a minimum of 250ml of water. Ideally taken before an evening meal or total intake can be split over 2 meals.